The following sections will discuss the terms associated with the ACME lead screw. As with any piece of hardware it is best to know the terminology associated with that product before using or purchasing. The major diameter, also referred to as the land or outside diameter, is the outer most diameter of the lead screw. For a ½-10 ACME lead screw, the major diameter would be 0.5 inches nominal. The minor diameter or the root diameter of a lead screw is the inner most diameter of the lead screw. The minor diameter is the diameter of the lead screw between the threads. There are two types or directions of the thread helix, left hand and right hand threads. Most Common threads are right hand threads. Always be sure to check if the lead screw is right hand or left hand threads before purchasing. Right hand threads are denoted (RH) and (LH) for left hand threads. The saying righty tighty lefty loosey describes a right hand thread and nut, where turning the nut clockwise or right moves the nut further along the lead screw. Left hand screws are opposite. 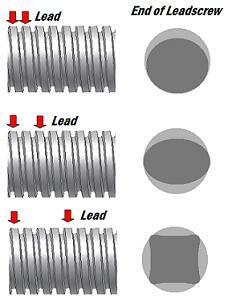 The image below illustrated how to identify left and right hand threads. ACME threads are different than threads found on standard threaded rod. The trapezoidal shape of ACME threads lends it well to power transmission. ACME threaded rod vs UNC or "typical" threaded rod. Among ACME threaded rod or lead screws there are three major classes; stub, general purpose (G), and centralizing/centering (C). The stub is the rawest form of acme threaded rod. Although it is still possible to make a CNC drive system from this type of ACME rod, it is usually worth paying the extra price for a general or centralizing ACME thread form. ACME stub threads do not have the straightness or tolerance of other classes. The efficiency of this class of rod is significantly less. General purpose is a step above the stub. General purpose ACME threads can be finished and have decent straightness, but depends primarily on the manufacturer. General purpose ACME threads ay need to be de-burred before use. Centralizing ACME threads have tighter tolerances on the major diameter than the other types of ACME lead screws. Thus these are less likely to bind under side loads. Centralizing threads are most common for power transmission purposes. Also, this type of thread will have a nice finish and will be the most efficient of the three. The pitch of a lead screw is the linear distance between the threads. Lead is the linear distance the nut travels and the lead screw for every one revolution. The lead is equal to the pitch times the number of starts. It is important to understand the lead of a lead screw as it is one of the most important aspects when choosing a lead screw. Check out the lead and pitch calculator here. There may be more than one thread strand on a single lead screw. These are call starts. Multiple start lead screws are usually more stable and efficient at power transmission. You can identify the number of starts of a lead screw by viewing the end of the lead screw. The figure below represents the most common types, single, double, and four start lead screws. This lead screw is ½ inches in diameter and contains 10 threads per inch. The information above does not specify the lead or number of starts. The number of starts should be stated elsewhere. This format is the most common. Caution : Some manufacturers lead screw information is given by diameter and turns per inch, NOT threads per inch. It does not matter when discussing a single start lead screw. However, the threads per inch and turns per inch are NOT the same when discussing multi-start lead screws. The simplest way to check is to verify the pitch and lead. Always be sure to check.